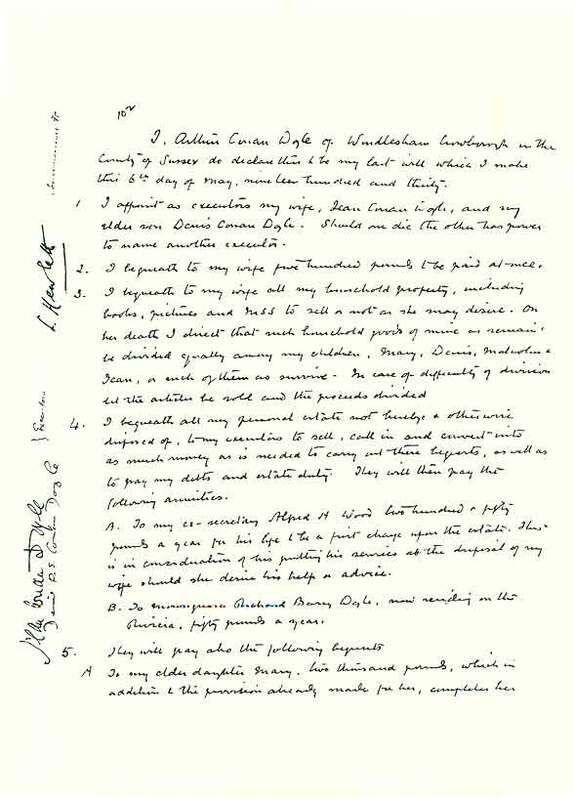 I, Arthur Conan Doyle of Windlesham Crowborough in the County of Sussex do declare this to be my last will which I make this 6th day of May, nineteen hundred and thirty. 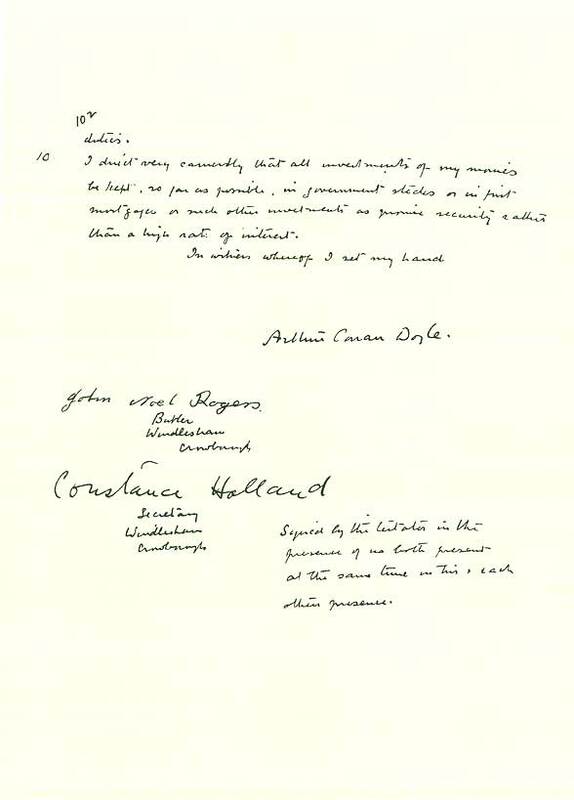 I appoint as executors my wife, Jean Conan Doyle, and my elder son Denis Conan Doyle. Should one die the other has power to name another executor. I bequeath to my wife five hundred pounds to be paid at once. I bequeath to my wife all my household property, including books, pictures and MSS to sell or not as she may desire. On her death I direct that such household property of mine as remains be divided equally among my children, Mary, Denis, Malcolm & Jean, or such of them as survive. In case of difficulty of division let the articles be sold and the proceeds be divided. I bequeath my personal estate not hereby and otherwise disposed of to my executors to sell, call in and convert into as much money as is needed to carry out these bequests, as well as to pay my debts and estate duty. They will then pay the following annuities. To my ex-secretary, Alfred H. Wood two hundred and fifty pounds per year for his life to be a first charge upon the estate. This is in consideration of his services of my wife should she desire his help and advice. To Monsignor Richard Barry Doyle, now residing on the Riviera, fifty pounds per year. To my older daughter Mary, two thousand pounds, which in addition to the provision already made for her, completes her settlement. Of this two thousand one thousand will come from my estate and the other thousand from my insurance which is held by F. Hamam Clark, solicitor of Gloucester. 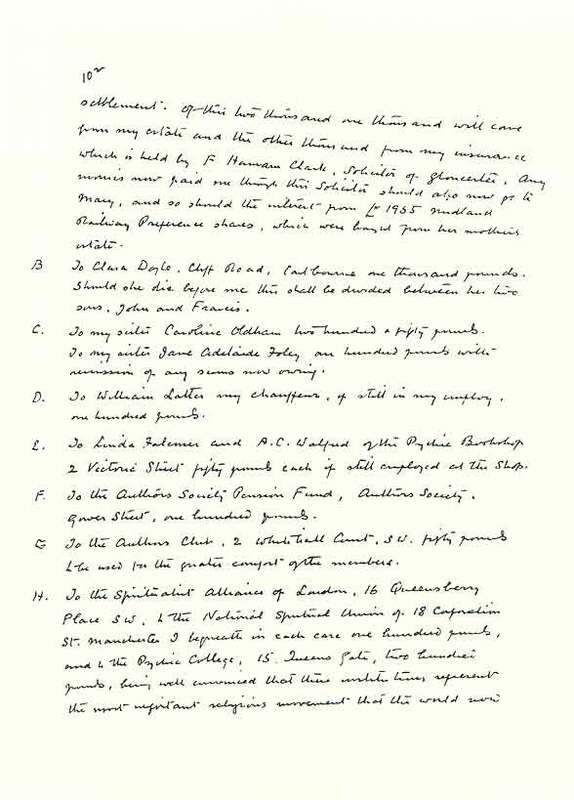 Any monies now paid me through this solicitor should also now pay to Mary, and so should the interest from L1955 Midland Railway Preference shares, which were bought from her mother's estate. To Clara Doyle, Cliff Road, Carlbourne, one thousand pounds. Should she die before me this shall be divided between her two sons, John and Francis. To my sister Caroline Oldham two thousand and fifty pounds. To my sister Jane Adelaide Foley one hundred pounds with remission of any sums now owing. To William Lotter my chauffer, if still in my employ, one hundred pounds. To Linda Falconer and A.C. Walford of the Psychic Bookshop 2 Victoria Street fifty pounds each if still employed at the shop. To the Authors Society Pension Fund, Authors Society, Ewer Street, one hundred pounds. To the Authors Club, 2 Whiticutt Court, S.W. fifty pounds to be used for the greater comfort of the members. To The Spiritualist Alliance of London, 16 Queensberry Place S W, The National Spiritual Union of 18 Corporation St., Manchester. I bequeath in each case one hundred pounds, and to the Psychic College, 15 Queens Gate, two hundred pounds, being well convinced that these institutions represent the most important religious movement that this world now holds. I would also leave one hundred pounds to the Spiritual Community which holds its meetings at the Protician Hall in Wigmore Street. If I have not left more to promote this cause it is because in my life time I have been able to devote considerable sums to this end and because my successors will, I know, follow my example in combating materialism, and endeavouring to infuse fresh vitality into the various religions of this world. 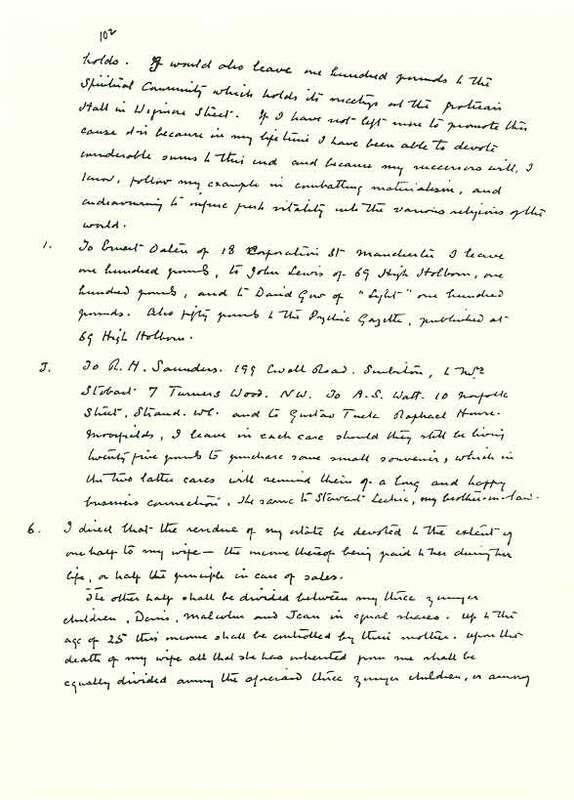 To Ernest Daten of 18 Corporation St Manchester I leave one hundred pounds, to John Lewis of 69 High Holborn, one hundred pounds, and to David Gus of "Light" one hundred pounds. Also fifty pounds to the Psychic Gazette, published at 69 High Holborn. To R H. Saunders. 199 Cowell Road, Solicitors, to W Slobart, 7 Turners Wood, NW. To A.S. Watt. 10 Norfolk Street, Strand We. And to Gustaav Tuck Raphael House Moorfields, I leave in each case should they be living twenty five pounds to purchase some small souvenir, which in the two latter cases will remind them of a long and happy business connection. The same to Stewart Leckie, mu brother-in-law. I direct that the residue of my estate be devoted to the extent of one half to my wife - the income thereof being paid to her during her life, or half the principle in case of sales. The other half shall be divided between my three younger children, Denis, Malcom and Jean in equal shares. Up to the age of 25 years this income shall be controlled by their mother. Upon the death of my wife all that she has inherited from me shall be equally divided among the aforesaid three younger children, or among such of them as survive. 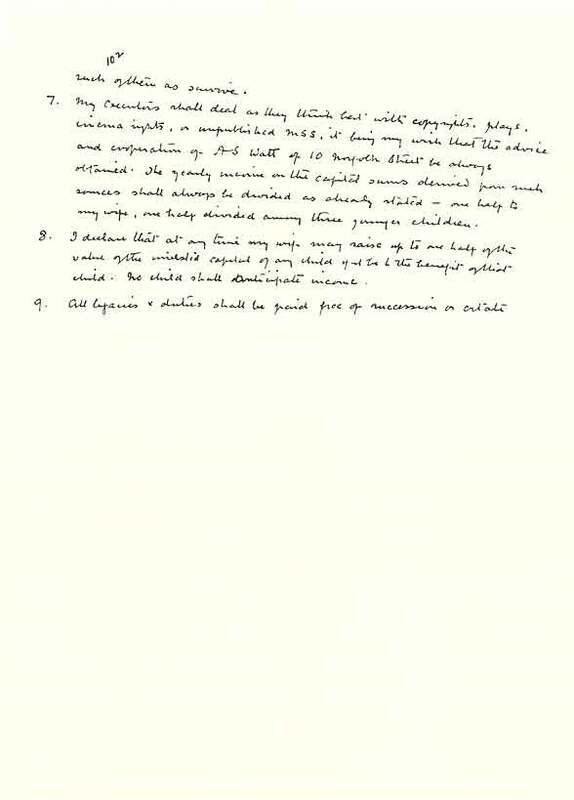 I declare that at any time my wife may raise up to one half of the value of the invested capital of the uninvested capital of any child if it be beneficial of that child. No child shall anticipate income. All legacies and duties shall be paid free of succession or estate duties. I direct very considerably that all investments of my monies be kept, so far as possible, in government stocks or in first mortgages or such other investments as promise security rather than a high rate of interest.